Following up the premiere of the Custom Yoka Show in November at DesignerCon the show is making it’s SECOND stop at Black Maria Gallery in Los Angeles. Come party with us at the opening on Thursday, February 18th. The nice folks from Designer Con also sent us some quality shots of our Yoka custom. 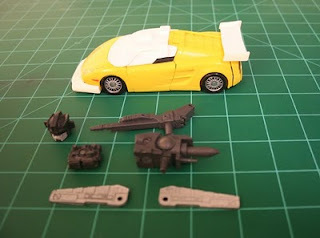 I recently received a Transformers Classics Wheeljack conversion kit from Master Collectors meant to transform the Classics Sunstreaker or Sideswipe into Wheeljack. I had been excitingly waiting for the kit until I actually took a closer look at it. I think the kit has potential, but I also think it will take a good deal of work to make a nice finished product. I do not intend to bash on this product, because I love that people produce fan made kits for collectors, and I do not want to detour people from continuing to do so, but I will give my honest critical review on this product. Before I get too much into the kit, I will first give some details about the character this toy represents. Wheeljack was a Scientist/ Engineer from the G1 Transformers cartoon. His vehicle mode was a Turbocharged Group 5 Lancia Stratos. While I think the Group 4 Stratos was a far better looking car, both would likely never been seen on the roads in the US at the time of the TF cartoon, thus making it a horrible disguise. As a kid, those kind of things really did not matter though, we were more concerned with just how cool it looked, and that each character had their own identity in both robot and alt modes. Now onto the kit. I received the kit in a brown soft envelope. My first concern is that the USPS already destroyed the resin parts, but I was happily surprised that everything was packed in a nice hobby case that I could use later for spare parts. 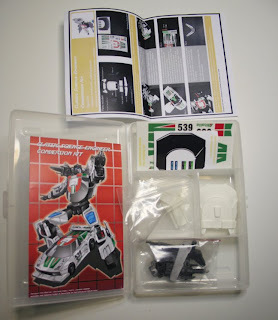 The kit included a printed postcard with their drawing of Wheeljack, instructions, two sticker sheets, and the parts in resealable baggies. There is a dramatic range of quality on the parts. The roof/cockpit area of the car will require the most clean up. The roof line, and pillar are not perfectly formed and there are some scratches and nicks. Here you can see the parts test fitted. In atl mode, there will be lots of left over parts. The head of course will be inside the vehicle but I chose not too connect it until I have repainted it. I do not know how well the neck hole will hold up to repeated removals, so I prefer to be cautious. 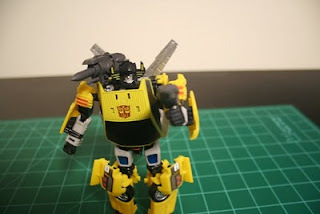 Here are the parts connected in robot mode, less the head. 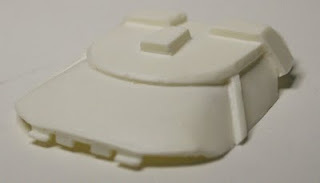 I am not keen on the lack of detail of the parts in the rear view and you can see where the shoulder cannon will need to be cleaned up with the seam line. The wings also lack the nice lines that are on the front of them. One concern I have is the front air dam may effect rotating the waist. The resin parts used here are very thin, and I feel I will need to be careful when posing the figure. I knew the kit was going to be resin, and there was a chance there might be some extra flash or something to clean up, but there was not really many flash issues on the kit. There was however some casting issues, and it is a bit messy in some spots, and will need to be cleaned up to match the quality of the toy these parts are going onto. Each of these parts have a different level of quality, and the reason is most of the parts were cast from bits of other toys. When I first opened the case the first thing I recognized was that the shoulder cannon was a toy I had as a kid. I actually still have it, but it is in storage, which is why I did not post pics of it. 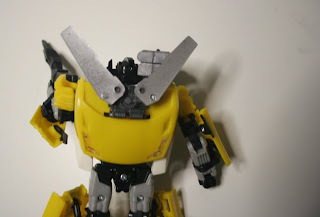 They added the peg so it could be mounted in the hole that already exists on the shoulder of the Sunstreaker toy, and they just made a mold from that. They even included the button that was spring loaded and would have sent the missile flying. My issue with this is that they copied something and did not bother to improve it. You can even see where the cast the screw that held this together into the mold. 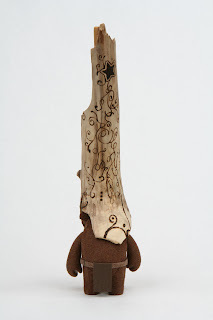 They should have filled the hole, and cleaned up the seams before using it to make a mold, and it would have been a nicer gun for very little work. In the image, on the far right you can see what used to be the button to fire the missile, and above you can see the hole where the screw would have gone. You can also see all the original seam lines. The next part that was a direct copy was the head. The head is a recast from the Energon Downshift figure. They did not do a great job of painting the mouth area, so I sort of wish they didn't even bother painting it. 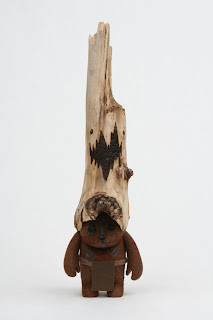 The head is fitting for the character though, but it is also not an original piece. This also suffers from having the screw hole in the back of the head, which they should have filled and made look more like a finished piece. 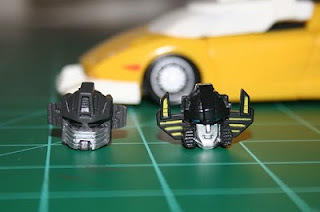 In this image you can see the head that came in the kit compared to the Sunstreaker head that was on the robot. I think I can make it look better with some new paint. In this image you can see the screw hole that was left unfilled. If you look close, you can even see the Phillips head screw inside. The flux capacitor looking thing that was on the top of Sunstreaker was recast to be used as the attachment for the wings of Wheeljack. This was not a bad solution, I just wish there was a place to store it when in alt mode. Considering the other recast parts and the quality I can only assume the wings were cast from something else as well. I think they look like a part that might have been from a Gundam or some other mecha model kit. 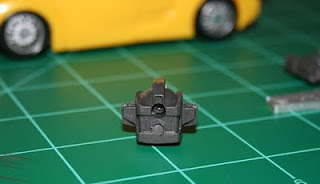 Wheeljack's handgun also looks to be a recast of a gun from a model kit. There are no screw holes, but there is a seam line which is why I suspect it was from a model. I am not sure what model, but it reminds me of some of the guns that came with the SD Gundam kits. There is a slot on the back to connect it to something else, which is not included in this kit. Then there is the body parts for the car that make it into a Stratos. The wing has two holes in the top of it that looks like they might have connected to posts that would go to a car in a model kit. I could be wrong, but it looks like they made the part under the spoiler themselves so that the new spoiler can slide on over the stock spoiler. They may have scratch built the whole spoiler, but then the post holes would not have made sense for them to add. The front air dam also looks like it came from something else. It has extra pegs on the bottom and some holes from what might have been the original ABS casting. Its not bad, its just thin in some areas and may be fragile. Finally we have the roof/cockpit area of the car. This is the section that should really help define the car as the Stratos. This really looks like the only part of the whole kit that they might have scratch built. The sad part is, that this piece also has the worst quality. The roof line that is above the windshield is a little rough as is the A-pillars. The windows are also sort of rough and need to be smoothed over. Looking at the vents on the roof, it looks as if those were glued on to the roof that the mold was made from. 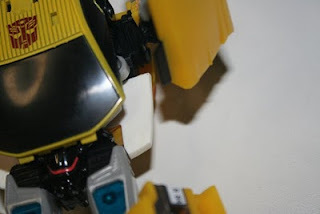 Looking over the whole piece, it looks like they either heavily modified part of something else, or they sculpted over top of the Sunstreaker roof to make their own design. Does it work? Well, from pictures I have seen of completed kits the finished product has potential. The colors and stickers make it clear that this is Wheeljack, and to a person not familiar with the Stratos, it would be an acceptable rendition. For me, the alt mode seems alright. The Sunstreak alt mode is inspired by a Lambo of some sorts, but with some borrowed elements of other super cars. This car is far too long to be a Stratos, and is lacking some of the other engine vents, but most people will not notice. The windscreen will be the most noticeable difference. In their response to questions, Master Collectibles says they had limitations on how they designed the windscreen. I think rather than trying to go under the hood, they could have had the window overlap the hood to get a better curvature. I do not think this would interfere with transformation. As for robot mode, that is really to be decided once I have finished the kit, so I will continue to review as I do my WIP for if the robot mode really is worthy of this upgrade. It is worth the price? It really depends on how you look at it. This is not as much as a custom kit, as it is a kit bash that has been recasted. A kit bash tends to involve using parts from other robots to build a new custom robot. In that respect, you would likely pay decent price to have sourced all the different parts to customize to make work for this. 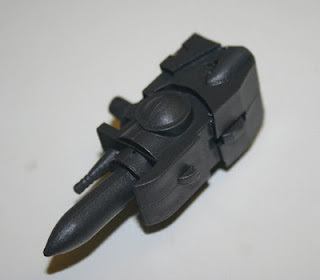 Whats keeps this from really being a kit bash like I described is that these parts have all been collected, modified and recast in resin, for what would first appear to be less work for a quick customizer. The problem is, that these parts really are not as great of quality as one might hope, and there is very little in the way of what was originally made, so that keeps this from really being a kit with original inspirations. Its all parts from other items, some that have been slightly modified and some that have not be modified at all. If your a huge fan of G1 Wheeljack, and the Classics line of Transformers with a passion for customizing, then this kit might be good for you, however I think for what it is, it is too expensive. I think this kit could have been much more reasonable to purchased if it was at least 33% cheaper, or a higher quality of parts for the final product. I will be starting on my WIP so if you want to see how this kit turns out, stay tuned. I may be tempted to customize this kit further to make myself happy with the final piece.